Plenty of room. 7 pocket expanding file with color tab inserts offers lots of space for all your school papers. Get organized! 6 pull up tabs to help you remember. The tabs easily pull up to serve as a reminder as to what’s filed and where. They also help you with prioritization and organization. It’s sturdy. Durable plastic outer shell with secure zipper closure protects those important papers, while reinforced gussets prevent sides from tearing. Personalize it. Its front cover has a clear pocket, so you can display a personalized cover sheet or use for storing more school papers -- class assignments or homework due that day! Convenient storage for pens. 2 loops on the outside of the file are for pen storage. Overall size of 13-3/4” x 10-3/4”. Plenty of room. 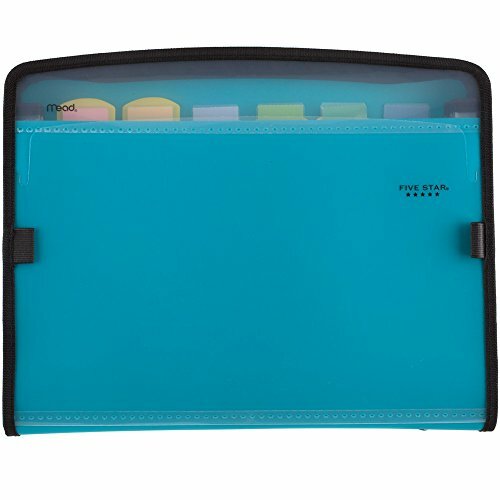 7 pocket expanding file with color tab inserts offers lots of space for all your school papers. Get organized! 6 pull up tabs to help you remember. The tabs easily pull up to serve as a reminder as to what's filed and where. They also help you with prioritization and organization. It's sturdy. Durable plastic outer shell with secure zipper closure protects those important papers, while reinforced gussets prevent sides from tearing. Personalize it. Its front cover has a clear pocket, so you can display a personalized cover sheet or use for storing more school papers -- class assignments or homework due that day! Convenient storage for pens. 2 loops on the outside of the file are for pen storage. Overall size of 13-3/4" x 10-3/4".